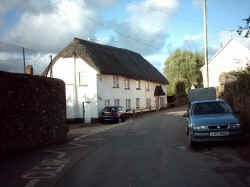 Cheriton Fitzpaine lies approximately 5 miles north-east of its nearest market town of Crediton. Other nearby market towns were Tiverton lying 7 miles north-west of the village, 10 miles west is Collumpton and 10 miles south-west is the City of Exeter. 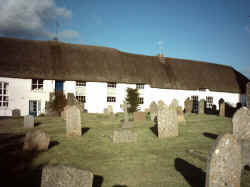 Cheriton Fitzpaine lies in the heart of the beautiful Devon countryside and still retains many of its character buildings and thatched cottages - it is another of those parishes where time has stood still and passing through is like going back to a previous era in history. 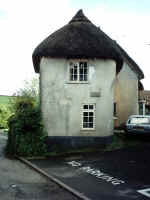 You can see on this page some pictures of the old buildings that Cheriton Fitzpaine can so proudly boast. Sadly the day I visited, in the summer of 2002, it decided to rain as soon as I arrived, so I didn't get the chance to do the exploring that I would have liked to and the photographs that I took, did not do the parish the justice that it so rightly deserves. But thanks to Farrell of Weston-super-Mare, who very kindly has contributed most of the photographs on this page so you can see some of Cheriton Fitzpaine in all its full glory! 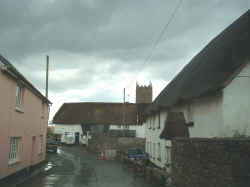 The parish derives its name from the old English of Cheriton, cirice+tun meaning "village with a church". The Fitzpaine part coming from the FITZPAYN family that were landholders in the parish in the 13th century. 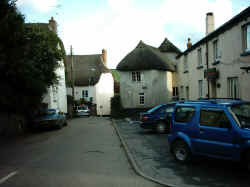 White (1850) further tells us that the Manor of Cheriton Fitzpaine was anciently held by the STANTON and FITZPAINE families, thus reinforcing how the parish got its name. In 1850, "Lord of the Manor" was the Rev. William Henry ARUNDEL, who held the parish for a great number of years. Other prominent landholders at the time were the FERGUSON-DAVIE family of nearby Sandford and also the FURSDON family of Cadbury. 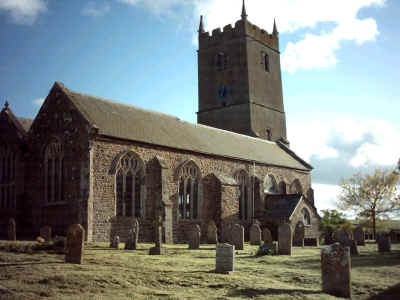 The church at Cheriton Fitzpaine dates from around the 14th century. It was originally dedicated to St. Mary [listed in both White (1850) and Kelly (1893) as such] but known as "All Souls" in its early days. Later it became St. Matthews, which is still it's name today. You can find more on the history of this beautiful church by visiting the St. Matthew's History page of the Cheriton Fitzpaine website. From Kelly's (1893) we learn that the parish also had a Congregational Chapel that seated 150 people and a Bible Christian Chapel for 100 people. 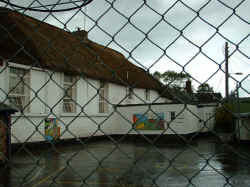 The Bible Christian Chapel is still used today and remains a Methodist Church. My own mother was a pupil here, during WWII. Her family lived in Exeter, but she was sent out to the country for safety, to live with her grandparents, Walter and Mary HEARD (nee WEBBER) at nearby Stockleigh English. Cheriton Fitzpaine's school was only a mile away from where she lived, but along way down narrow country lanes, when you have to walk! Farming in the past was undoubtedly the main occupation in the village and from the early trade directories, such as White (1850) and Kelly (1893) we can see that there were a large number of farms in the area. White (1850) gives turnips and wheat as the main crops grown in the parish. If we compare the census figures between 1851 and 1901, there was a huge drop in the population of Cheriton Fitzpaine, which almost halved from a population of 1207 persons recorded in the parish in the 1851 census to a mere 678 recorded there in 1901. See Historic Populations below. Changes in farming methods meant that less agricultural labourers were needed to work on the local farms and no doubt many of them were forced to move away from the parish in search of work elsewhere. The parish appears to have had two pubs between 1850 and 1893, although their may have been more in previous years. The Ring of Bells and the Half Moon are, listed in White's (1850) and Kelly's (1893) Trade Directories of Devon as the public houses in Cheriton Fitzpaine. Below are their publicans from each of the directories. 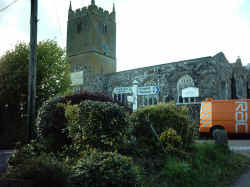 Both the Ring of Bells and the Half Moon are still Cheriton Fitzpaine's "locals", having served the parish for over 150 years. In the the picture to the right you can see the Half Moon Inn with a sign above the door that reads "Half Moon Inn". Cheriton Fitzpaine in GENUKI giving information about the parish and an old map of the Parish Boundaries. Cheriton Fitzpaine Community Website for information on the parish and also where you can read their monthly church magazine "Cheriton News Online". They are very kind and will print your research interests in their church magazine if you have ancestors that came from the area.